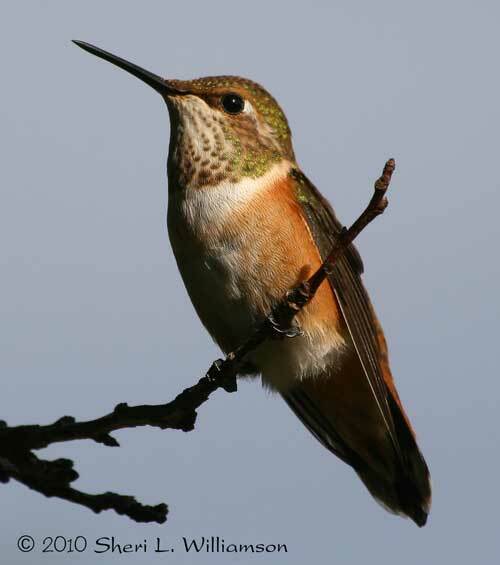 Costa’s Hummingbirds are true desert dwellers, but all North American hummingbirds can tolerate summer heat if they have plenty of water. Yes. They’ve been doing it for millions of years. As long as they’ve got shelter from the sun and plenty of water for evaporative cooling, they should be fine. 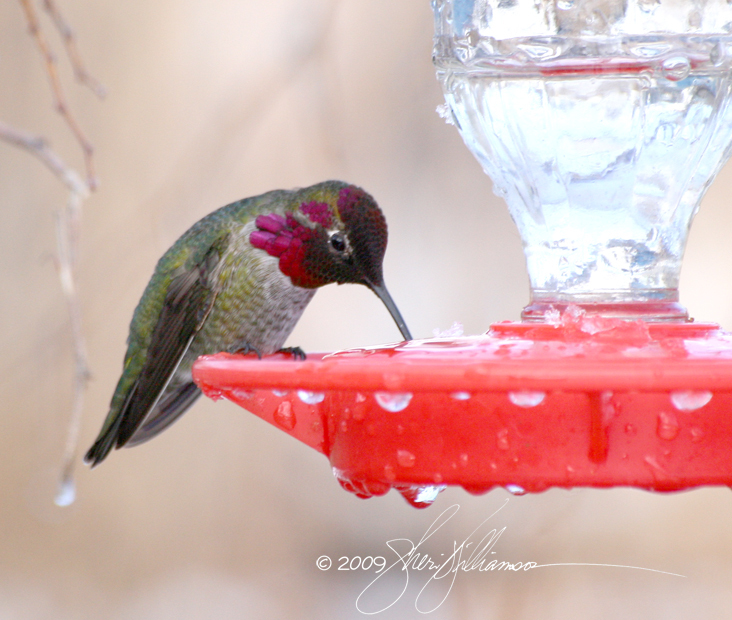 Hummingbirds will drink plain water when conditions are particularly hot and dry and/or nectar is hard to come by, but the usual sources of water pose risks of disease transmission from other birds, poisoning from rain or irrigation runoff contaminated with pesticides, weed killers, oil, antifreeze, etc. 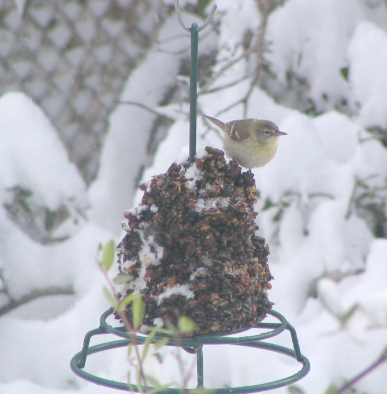 It’s safer to put out a separate feeder filled with plain water or change the sugar-to-water ratio of your feeder solution. When the daytime highs start creeping into the 90s F., I reduce the concentration of my solution to 1 part sugar to 4 parts water. 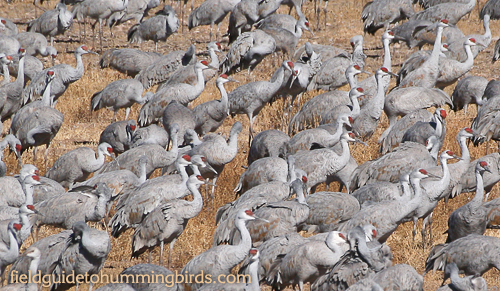 When temperatures rise to over 100° F. (which they don’t very often here in the high desert), I back off to 1:5. In parts of the Southwest where temperatures are topping 110° F., a 1:6 ratio would be advisable. Weaker solutions tend to spoil faster, but on the plus side they also tend to be less attractive to bees. 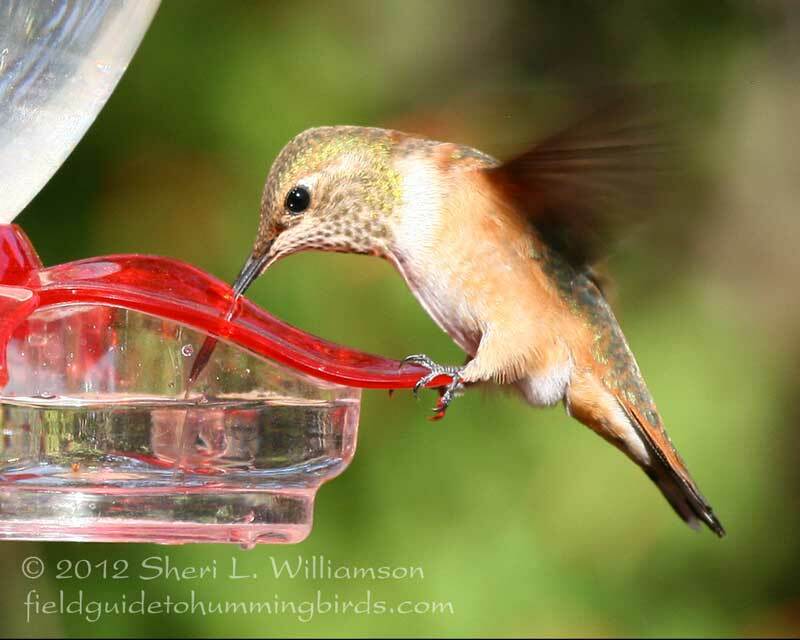 Providing water for the outside of the bird is another way to help beat the heat. I added a mister to our drip irrigation system that runs for a few minutes a day, spraying into the foliage over my hummingbird garden. It’s used year round but is especially appreciated in summer, helping to keep the birds cool and their insulating plumage in top condition. I hate to end on a down note, but the hard fact is that every organism on Earth is going to have to adapt to rising average temperatures and greater extremes, and those that aren’t well suited to withstand “the new normal” just won’t survive. Hiebert, S.M. and W.A. Calder III. 1986. 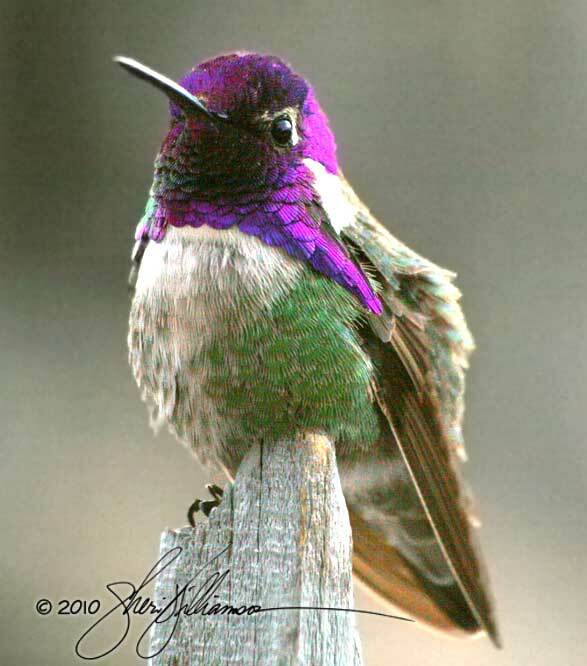 The osmoregulatory consequences of nectarivory and frugivory in hummingbirds and other species. Proc. XIX Internat. Ornith. Cong ., Ottawa, Canada. 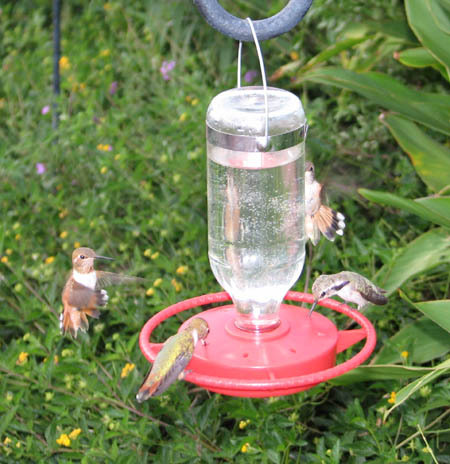 Because hummingbirds aren’t humans, as I’ve pointed out here before, and one species’ meat is another species’ poison. 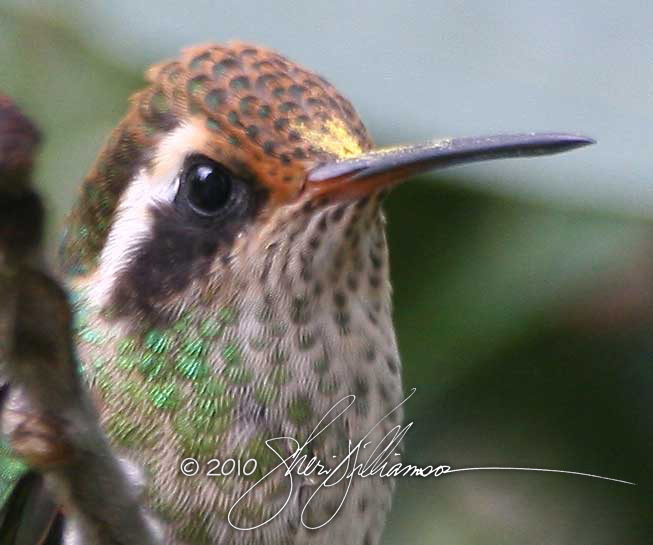 Hummingbirds, on the other hand, are tiny, hyperactive creatures with raging metabolisms fueled in large part by naturally concentrated sugar sources (primarily flower nectar). Our smaller northern species need at minimum the caloric equivalent of ~40% of their body weight in sugar every day just to function. Even at our elevated consumption levels, it would take the average American more than six months to eat 40% of his or her body weight in sugar. * I’ve also said here before that sugar doesn’t cause diabetes, based on assurances by ostensibly credible organizations, but recent research has established a very strong correlation between sugar availability and type 2 diabetes. It appears that Big Sugar took a page from Big Tobacco’s playbook and worked tirelessly for decades to keep the public from learning the facts about their product.